This article by Anita Malhotra, Senior lecturer in ecology and evolutionary genetics at the School of Biological Sciences was originally published on The Conversation. Read the original article. Gerry climbs up to the veranda of our tribal longhouse with a snake bag held out in front of him. “Now don’t get too excited, but I’ve just caught a Gerry Martin with Kaulback’s pitviper Insert: Close-up of Kaulback’s pitviper : Photo credit: Vishal Santra. Insert photo credit: Wolfgang Wüster.Kaulbacki,” he says, looking pleased but exhausted from a long hike and a six-metre climb up a tree. We gape, hardly able to believe that we have finally found this rare snake alive after four years of intensive searching. Kaulback’s pit viper, first discovered in 1938 by British explorer and botanist Ronald Kaulback in northern Burma, is one of the largest pit vipers in Asia. On top of that, according to local reports, its bite is lethal. Despite being a co-author on the most recent paper on the species, I had never before seen a living specimen – few scientists have. I can’t believe my luck at being present for this moment on my first trip to Arunachal Pradesh, a heavily forested state on the north-east frontier of India. This trip is, for me, the culmination of a long personal journey. During my teenage years in India, a family holiday to neighbouring Assam had triggered my curiosity about the natural world, until then only nurtured by tales of exploration and discovery. While now considerably less remote, life on the edge of the jungle is still hazardous. The Nyishi tribals now cultivate rice in the valleys, but on steep hillsides still resort to traditional shifting cultivation – using an area for a while and then abandoning it. As they clear forest, they encounter snakes. And while not all are venomous, monocled cobras, king cobras, banded kraits and others are quite capable of killing people. 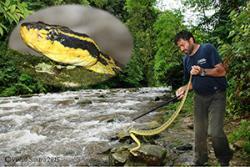 Yet, of all these, it is the barta (a local name for Kaulback’s pit viper) that the locals fear the most. 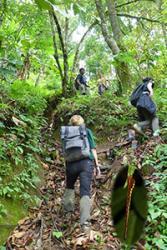 The team had to face many challenges including the steep terrain, leeches (inset), sandflies and torrential rain during the trip. : Photo credit: Anita MalhotraDespite its reputation, our snake is actually not aggressive and rarely attempts to strike – and when it does, it is slow. Curiously, the locals identify the snake that Gerry has just caught as something they call taiji rather than barta, and are adamant that this is a different, less deadly, snake. We count scales and confirm that is a male Kaulback’s pit viper. As in many pit vipers, female Kaulback’s are bigger and may be more dangerous than males as they guard their eggs near the ground. When we release the male, it heads up a large tree at a leisurely pace; we lose sight of it at around eight metres, still climbing. It is hard to view this beautiful snake as a terrible threat to people. But for the time being we don’t actually know just how dangerous it is – analysis of its venom is needed to confirm that. This expedition is part of a larger collaborative study to document the identity and distribution of dangerously venomous snakes and to study their venom in order to reduce the India’s death toll by snakebite which is a massive 45,000 people each year. Each species of snake has unique venom containing a cocktail of toxins, requiring specific antibodies to neutralise. Even a single species can cause paralysis, blood disorders and tissue damage in varying proportions in different parts of its range. The most effective treatment for snakebite, anti-venom, is still made in the same way as it was when invented in the 19th century, by extracting blood plasma containing antibodies from animals injected with diluted snake venom. It can therefore only effectively neutralise toxins present in the venom mixture used in the immunisation process. Yet all anti-venom in India is currently manufactured predominantly using venom obtained from a single licensed producer. While several proposed snake farms in different parts of India may soon allow venom from all over India to be used to raise antibodies against a wider range of toxins, more work needs to be done to reduce the dosage, cost of treatment and occurrence of serious side-effects. Furthermore, none of the “Big Four” (Russell’s viper, spectacled cobra, common krait and saw-scaled viper) against which the Indian anti-venom is manufactured, are found Arunachal Pradesh. Exactly which species are the most deadly there and how many snakebite deaths they cause is unknown. Official records of snakebite are virtually non-existent and the tribes in the region are unlikely to go to hospital, even after a life-threatening bite. Emerging evidence from the southern states of India also suggests that the hump-nosed pit viper may be at least as medically significant as the saw-scaled vipers in the few states in which it occurs. This implies that producing regionally specific anti-venom, rather than a single one for all India, might be a better approach. 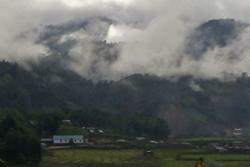 A view of the valley in Arunachal Pradesh that hosted the expedition. : Photo credit: Anita MalhotraVenom research is one of many activities needed to reduce the burden of snakebite – but this is currently hindered by lack of funding and the need for permits to catch snakes, which are strictly protected in India. What’s more, you need to contact each state individually for permits, magnifying the problem considerably. It is also important to raise awareness of the problem in rural areas – and provide training for primary health care staff, as well as equipping them with vital equipment (such as ventilators) and providing them with direct links to snakebite experts. A few grass-roots organisations around the country are working on this, but they are largely dependent on volunteers and charitable donations. In some areas of India, doctors specialising in treating snakebite have achieved success rates of 100%, but in a country as large and densely populated as India, it is difficult to see how the burden of snakebite can be reduced substantially without being government-sponsored and properly funded. In some states, the families of snakebite victims are able to claim up to 1 lakh rupees (about £1,000) as compensation. Ironically, just one year’s potential compensation bill would go a long way to acchieving a long-term reduction in the financial cost of snakebite – let alone the cost in human misery and suffering.